Central Vacuum System, Citrus County Whole House Vacuum, Home Intercom Installation, False Alarm Tips. 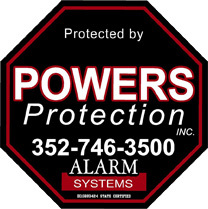 - Powers Protection Alarm Systems Inc.
How Does a VacuMaid® Central Vacuum System Work? A VacuMaid® central vacuum system can reduce the number of allergens in your home by extracting dirt, dust, mold, pollen, and pet dander out of your carpet and furnishings - and it’s simple. The system sends these allergens through the network of hidden tubin g in your walls to the dirt can located in a remote area of your home. By doing this, the central vacuum system rids your home of these potentially harmful irritants--unlike most portable vacuum cleaners, which leave much of the fine dust recirculating in the air. Also, by having a central vacuum vented to the outside of your home, it is possible to remove even the smallest of particles from your living environment. The picture is an example of a typical installation. The power unit is placed in the garage with the dirt canister near the garage door. This allows for easy emptying of the canister and placement of a utility valve for cleaning out your car. The power unit is placed in a more remote location. The tubing can be run through the attic, basement or in the floors. Inlets are placed strategically in hallways. 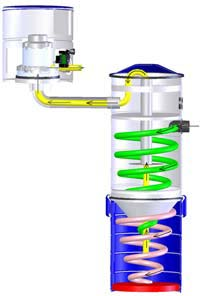 VacuMaid® systems use cyclonic separation. This differs from "filtered" central vacuums in the way fine particles are removed. While a filtered system uses a bag to catch these particles, a cyclonic system completely removes these particles by venting them outside. As dirt enters the canister, the air inside swirls like a tornado with the heavier debris falling to the bottom of the can, while the fine particles are vented outside. This prevents most of the dust from getting into the motor. Some competitors may say that there is no way to keep all the fine dust off of the loading fans, but our cyclonic power units and Ametek motors are built to withstand dust in the motor without affecting the life or function of the system. Ametek specifically designs motors to function under these conditions for use with VacuMaid® cyclonic systems. Power Unit - Houses the system's motor and electrical components. Dirt Can - Collects the large dirt and debris swept up while cleaning. This is the point at which cyclonic separation occurs. 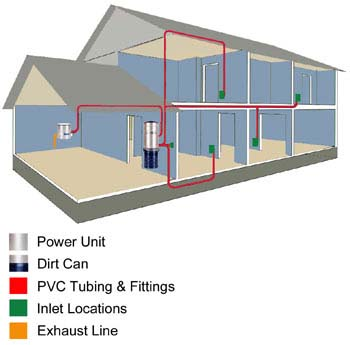 Tubing & Fittings - Vacuum tubing concealed within your walls connects the inlets to the unit. Dirt travels through this network of tubing and is deposited into the can. Inlets - Locations at which you connect your hose into the system. The inlets are conveniently located in various areas around your home. Tool Kits - Provide you with the tools necessary to clean your home. They include the hose that is required to make the system function. Along with the Central Vacuum system we also do offer Intercom Installations and Access Control Services.